Home / Fun / Partner Up! “Partner Workout” — What’s your reaction when you see these words on the board? Are you excited? Are you eager to meet somebody new? Or, are you terrified? 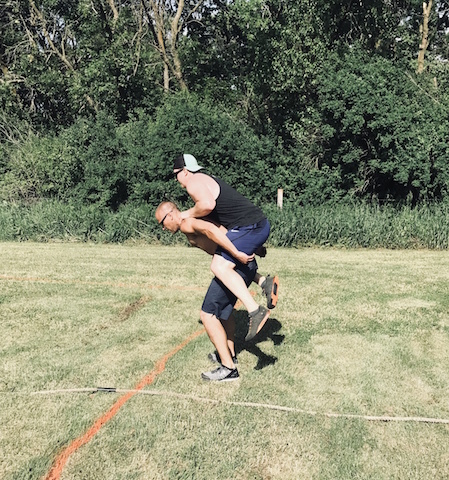 Partner workouts can add a lot of fun but for some the feeling of dread takes over which is usually brought on by a fear of letting their partner down. People start comparing themselves to others and out come the apologies. As a coach, I never want a workout to result in someone thinking or feeling they are not good enough. Partner workouts are meant to keep things fresh by bringing a different dynamic to your routine. It’s about team building. Think more in the lines of cooperation–not competition. One of the best things about CPM is our community! Partner workouts push you do perform your best and allows for you to help your partner do their best as well. The format of most partner workouts usually allows for a rest period and who does not like to rest?! ?😁 Take full advantage of this time so when it’s your turn you can give it a100%. So next time you see a partner workout on the board, kick those negative thoughts to the curb, attack the workout like you would any day and never apologize for doing your best!!! Next 4 Pillars of Health – What Is Missing In Your Life?